At the mention of the villain Haman’s name during the reading of the story of Esther, the congregation at Temple B’nai Israel twirled loud noisemakers. The festive Purim celebration was held on March 12 at the Easton Synagogue. Easton – While winter storm Stella — which means star — made her way to the Mid-Shore, congregants at Temple B’nai Israel celebrated a true star of Judaism, Queen Esther, with noisemakers, costumes and smooth jazz. 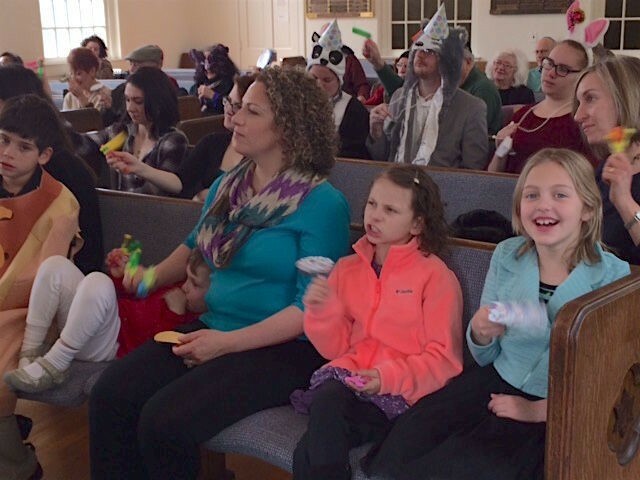 Purim, the “most fun-filled, action-packed day of the Jewish year,” according to Chabad.org, drew about 50 people to the Easton synagogue at 11 a.m. Sunday, March 12. Visiting from Loudon, N.H., the sisters (who sported painted cat whiskers on their cheeks) said they weren’t raised in any religion, but accompanied Brian and Sheffi Macdonald of Easton. The Book of Esther, whose name means “star” in Persian, chronicles the queen and her cousin Mordechai’s success in saving the Jewish people from extermination on the orders of the murderous prime minister Haman. Rabbi Peter Hyman greeted young and old as they arrived for the festive occasion and picked out New Year’s Eve style noisemakers called graggers to twirl every time the name of Haman was mentioned during the traditional, and festive, reading of The Megillah, also known as the Book of Esther. Before the reading, however, Hyman asked the congregation if they had any jokes they wanted to share. Youngsters in the front row came up, one at a time, and shared their corniest riddles. Continuing the stand-up comic trend, Rabbi Hyman and two other men shared their jokes to the equal delight of the gathered. The rabbi sang part of The Megillah in Hebrew from a small scroll, then set it aside and read a condensed, loosely translated version of the Esther story. Punctuating the story was the jazz trio playing excerpts from pop and show tunes, including “If I Were a Rich Man,” “New York, New York,” “The Chicken Dance,” “I Heard It Through the Grapevine,” and — at Haman’s demise — “Happy Days are Here Again.” After the celebration, traditional hamantashen, filled cookies in the shape of a triangle, were served with dried fruit, nuts and cider. The first 100 hamantashen were baked by Marcia Shapiro, a member of the congregation and an emergency room nurse at the University of Maryland Shore Medical Center at Easton. The rest of the cookies were provided by Weis Markets, “the only store in town to carry hamantashen,” Hyman said.